This story was updated at 5:35 a.m.EDT. PASADENA -- The Fourth of July began with abang here early Monday morning as NASA's Deep Impact mission collided withhistory. "There is a comet up in the skywondering, what in the heck just happened," said JPL director Charles Elachi during a post-collision press conference. The $333 million mission to crash an820-pound (371-kilogram) Impactor probe into the avocado-shapedComet Tempel 1 and record the event via a Flyby mothership was a complete success. Missionmanagers at NASA's Jet Propulsion Laboratory (JPL) said the probe,jettisoned almost 24-hours earlier from Flyby, collided with the comet at 1:52a.m. EDT (0552 GMT). The impact was confirmed by flight controllers on the ground at 1:57 a.m. EDT. The control room erupted in cheersas the first images from Impactor's perilous approachto Tempel 1 were transmitted to Earth via the Flybyspacecraft. "I can't believe they're paying usto have this much fun," exclaimed Don Yeomans, a DeepImpact mission co-investigator for JPL. "The impact was bigger than what Iexpected." Deep Impact scientists said theyhave already received some data from orbital and ground-based observatoriesthat provided additional vantage points to the impact. "We're getting a lot ofresults," said Michael A'Hearn, Deep Impactprinciple scientist from the University of Maryland. "Theyobserved a brightness increase of about two magnitudes, and a few telescopesreported big increases in the emission lines." 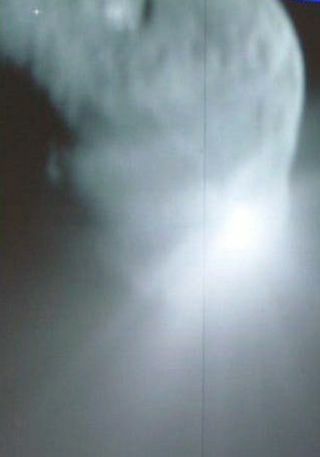 Impactor ended its almost six-month missionby successfully transmitting back images of the comet as it raced at a speed of44,000 miles per hour into the surface of Tempel 1.That initial success, however was eclipsed when Flyby successfully transmittedback the first image of the Impactor's collision withTempel 1. "I just can't believe it. It'sabsolutely incredible," said Alice Phinney, LeadMechanical Design Engineer for the Impactor at BallAerospace in Boulder, Colorado. She was one of over 600 companycolleagues and friends that gathered at Boulder'sFiske Planetarium. Phinney told SPACE.com that she worked on the Impactorthat smashed into the comet for some two years. One of her key jobs wasmaximizing the use of copper in the Impactor design. The task was not as straight-forwardas it would seem. "There were a lot of assumptions. Scientists were all overthe map," Phinney said regarding the overallcomposition of Comet Tempel 1. "That's why I love engineering...atsome point you've got to make a decision." The Impactor"worked like a champ," Phinney said. Atop the FiskePlanetarium, rooftop observers using a 24-inch telescope reported seeing abrightness of the comet at impact. "This is the biggest thingthat's happened for the company," said RozBrown, a spokeswoman for Ball Aerospace, which built the Deep Impactspacecraft. "This is huge for us." After a brief celebration, DeepImpact flight controllers gradually called mission engineers and scientistsback to their posts. Impactor's mission may now befinished, but its Flyby mothership still has imagesto deliver and more observations to make of Tempel1's surface. "We still have a Flyby spacecraftwhich is still collecting data, so we have to stay focused," JPL directorCharles Elachi said. "I think it was worth every centwe spent on it." The Deep Impact was reported ashealthy after managing to track Impactor's collisionwith Tempel 1 down to about 50 meters, then turn its imaging lenses away from the comet to guardthem from debris as the spacecraft passed underneath the nucleus. In the two hours preceding thecollision Impactor was basically on its own, as wasthe Flyby spaceship, Yeomans explained earlier in theday. Within that time period, Impactor performedthree course corrections. Impactor's first targetingmaneuver, or course correction, was a 21.5-second burn that occurred about 90minutes prior to impact. "As soon as the first [trajectorymaneuver] went off on the Impactor and it workedfine the confidence just went sky high," Deep Impact's deputy project managerKuyer Patel told SPACE.com. "We had a full spacecraft that had just been released on its own 24 hoursago and it had three sets of thrusters on it, one for attitude control and onefor maneuvers. All of that got checked out right after its release so this wasthe only unknown left, so as soon as that firsttrajectory change happened, everyone was just confident at that point." The second course correction took place about35 minutes prior to impact and the final at 12-and-a-half minutes. "It takes 7/ ? minutes for thesignal to get back to Earth, so you can't joystick this thing," Yeoman said. "You have to rely on the fact that the Impactor is asmart spacecraft as is the Flyby spacecraft. So you have to build in theintelligence ahead of time and let it do its thing." For mission managers, thespacecraft's automated controls worked perfectly. Such success will be repeatedin the future, Yeomans said. "This isn't the first time auto-navigationwas used," Yeomans explained. "It was actually aback-up system for the Deep Space 1 mission that flew past Comet Borrelly back in 2001. That was a checkout for a back-upsystem that was not relied upon, but now, of course, we are indeed relying onit. So that's a new wrinkle for this mission." Also, Deep Impact's use of opticalnavigation is something NASA has relied on for years. "By using the onboard telescopesystem to prove our knowledge of where the comet is not new," said Yeomans. "But it builds on what has been done in the lastseveral years in terms of 'smart' spacecraft. That is a trend, of course, toget this small army of navigators on the ground down to where it is now just ahandful of folks." Yeomans said he believed that it would takeabout 12 hours from impact to download all of the events images. "But it will take months, evenyears, before all the science is even squeezed out of the data," said Yeomans. "Within the first six months the highlights willbe published, but there will be analyses going on for quite some time. It's notjust the spacecraft that is observing this comet. Chandra has observing in theX-ray spectrum. Spitzer will be observing in the infrared. Hubble will beobserving in the visible." Yeomans hoped that the success of DeepImpact would lead to more ambitious missions. "The next step is to actuallyrendezvous with a comet, orbit it, and then land anddo surface analysis," Yoemans said. "Which is what the Europeans expect to do with the Rosettaspacecraft in 2014." Ultimately, Yeomanssaid that the most ambitious mission would be to land on a comet, take a sampleand return it for study in Earth-based laboratories. "There have been proposalsto do just that. Nothing funded," Yoemans said. "Butwe're thinking that way." SPACE.com Senior Space WriterLeonard David contributed to this story from Boulder, Colorado.Staff Writer Tariq Malik contributed to this story from New York City.